During our trip through Texas in the spring of 2015 we were treated to splashes of color from the wildflowers blooming beside the roads, in fields, in the woods, and beside trails. We had timed our trip in hopes of seeing bluebonnets and weren’t disappointed. We were also treated to many other wildflowers including many I couldn’t identify. I would love to get some help in identifying the unknown flowers! Please leave a comment if you know what any of these are, or if I have gotten any of the identifications wrong. Thank you! As we traveled east from Louisiana to Alabama on I-20 we crossed the Mississippi River into Vicksburg and stopped at the Welcome Center to take a break. It was drizzling rain but we were still able to have a beautiful view of the mighty Mississippi. After our short stop we continued on our journey. Our destination was Prairie Creek Campground near Lownesboro, Alabama, the first Corps of Engineers park we ever stayed in. Were we pleasantly surprised back in 2007 to find big sites, paved pads and a well maintained park. Ever since that first stay in a COE campground we look for them whenever we are traveling. Our second visit to the campground did not disappoint. When we weren’t enjoying the view of the Alabama River from our site we took a drive to explore the dam. The sunsets were gorgeous right from our site. What a great ending to our spring road trip! Every once in a while we discover an unexpected gem of a park. We just needed a quiet, restful place to stay for a couple of days after our adventure in Palo Duro Canyon. A place where we could buy some groceries and just chill. Lake Arrowhead State Park south of Wichita Falls sounded like it would fit the bill. As it turned out we enjoyed it so much we stayed an extra day. It was wonderful seeing so much green after the brown plains of Texas. We had a nice big site with plenty of green grass and trees. There were hardly any other campers in the park and we sometimes felt like the only ones there. Texas has been going through a drought for several years and many lakes have suffered because of it. Lake Arrowhead is really low and has been for a while. 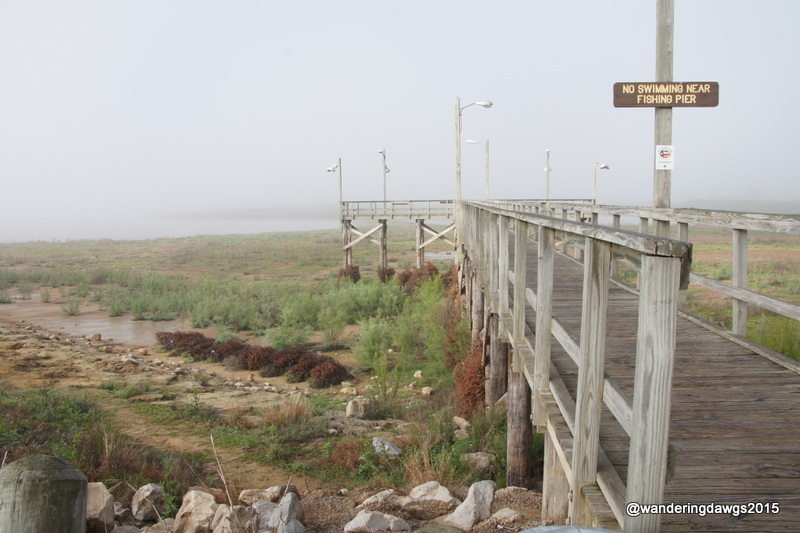 The fishing pier is high and dry and all of the boat ramps are closed. 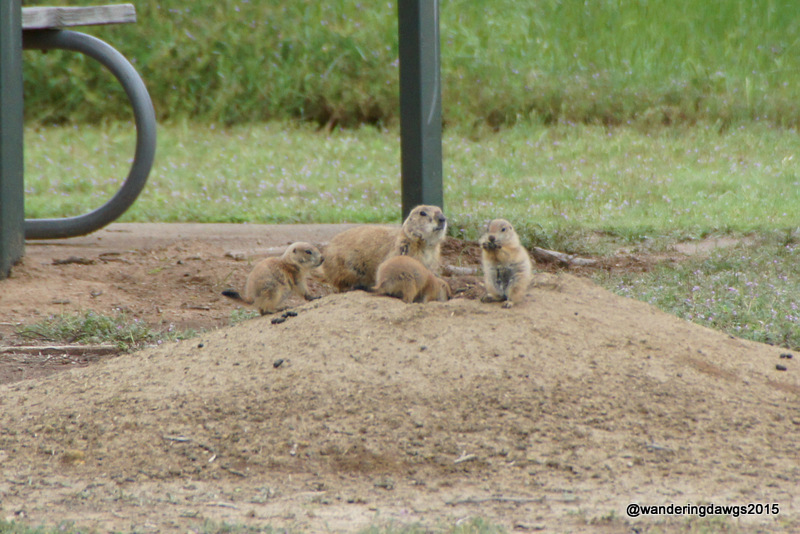 There is a Prairie Dog Town in the park that has spread to some of the campsites. Some of the holes were right beside the road and Blondie tried to stick her nose in them as we walked by. 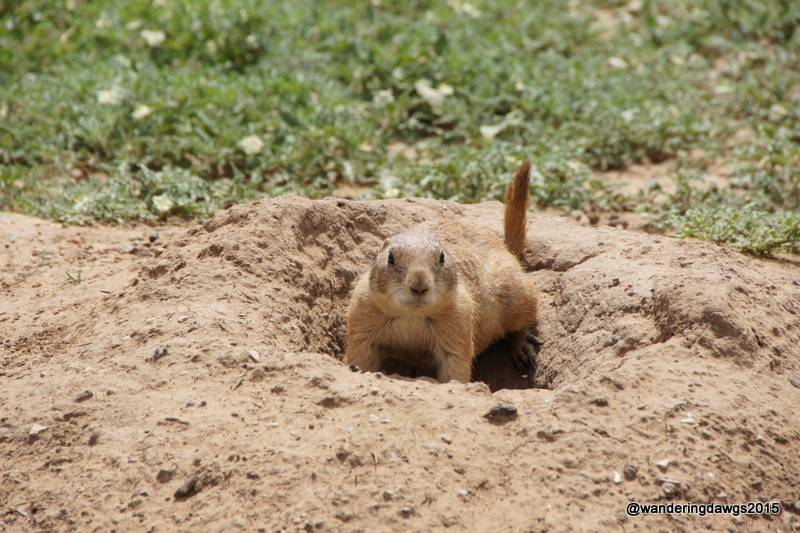 The Prairie Dogs would scamper away to their hole and disappear as Blondie and I approached on foot. They would stay around longer when we drove by in the truck. There is a working oil pump in the campground. 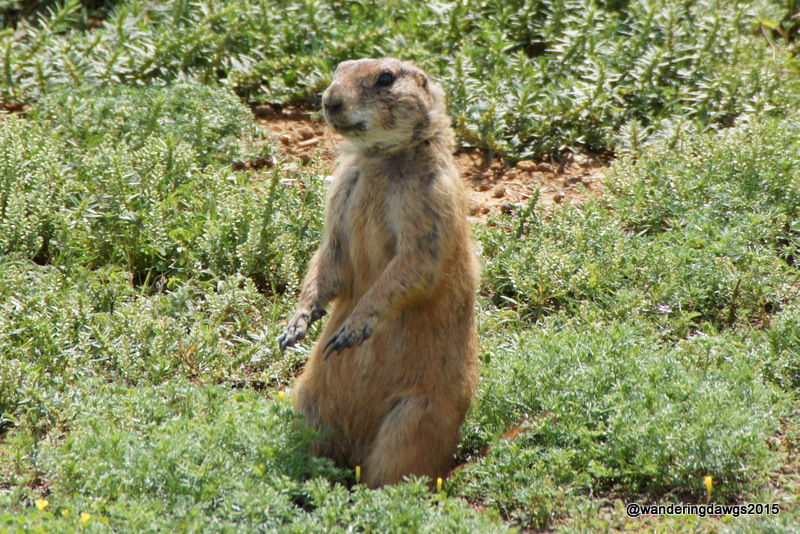 After seeing so many of them in the fields as we drove through Texas it was interesting to see one up close. The engineering term for this type pump is a walking beam. 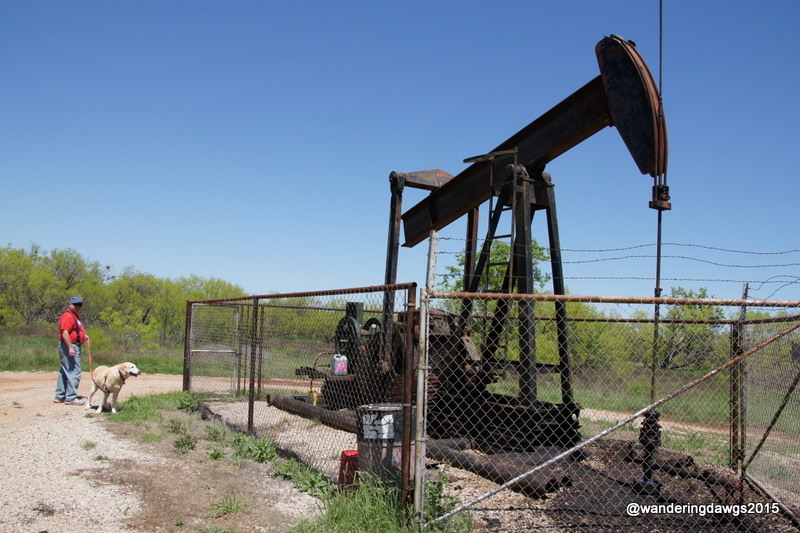 More common names for it are horsehead pump, nodding donkey, beam pump, rod pump, grasshopper, thirsty bird, pump jack or jack pump. 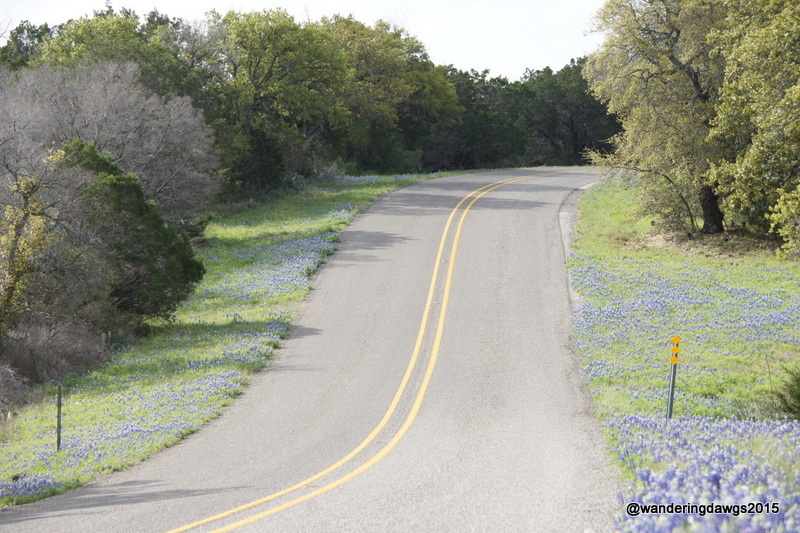 I was happy to see bluebonnets and other wildflowers growing beside the road. It was a great place to chill before continuing our trek east. The ranger who checked us in was very friendly and helpful and gave us great directions to shopping in Wichita Falls. She also recommended the Branding Iron for barbeque and it was delicious. Our site was a pull through with paved pad, large grass sitting area, a covered picnic table and fire ring. The site had water and electric hookups. There was a bath house close by, several picnic areas and hiking trails in the park. If you would like to read my detailed campground review of this park, click here. Inks Lake State Park in Burnet (pronounced BURN-it DERN it) was our home for the 4 nights before Easter weekend. Thanks to my friend Tim in Arlington for recommending this park. We arrived early in the day and were able to get a beautiful waterfront site. The bad news is we would have to leave on Good Friday because the park was full for Easter weekend. I knew we would love the area when we saw bluebonnets lining the roads to the park. Our waterfront campsite was a great place to watch ducks, geese and all the water activities. We saw people paddling canoes and kayaks, floating on tubes, and fishing from motor boats. The sunsets were gorgeous. I love talking to locals to find out the best places to see. We stopped at Longhorn Caverns State Park one morning to ask about the tours. The ranger had seen me taking pictures of bluebonnets beside the road and he told us about a great scenic drive south of Llano. We were headed to Llano for lunch so we were off on a bluebonnet hunt after we stuffed ourselves with brisket and ribs. One afternoon we toured nearby Longhorn Caverns. During prohibition the cavern was privately owned and the cavern was run as a honky tonk and restaurant. In one of the large rooms was a bandstand with tables set up all around. When prohibition was repealed the owner gave the land to the state of Texas. One morning we took a hike on the Valley Spring trail in the state park. The trail started out beside the lake and wound through the woods with wildflowers growing beneath the trees. Inks Lake State Park has moved up near the top of my list of favorite state parks. Our site was a back in paved pad with water and electric hookups, a picnic table, fire ring, and lantern hook. We had a huge area beneath shade trees to set up our chairs and watch the world go by. 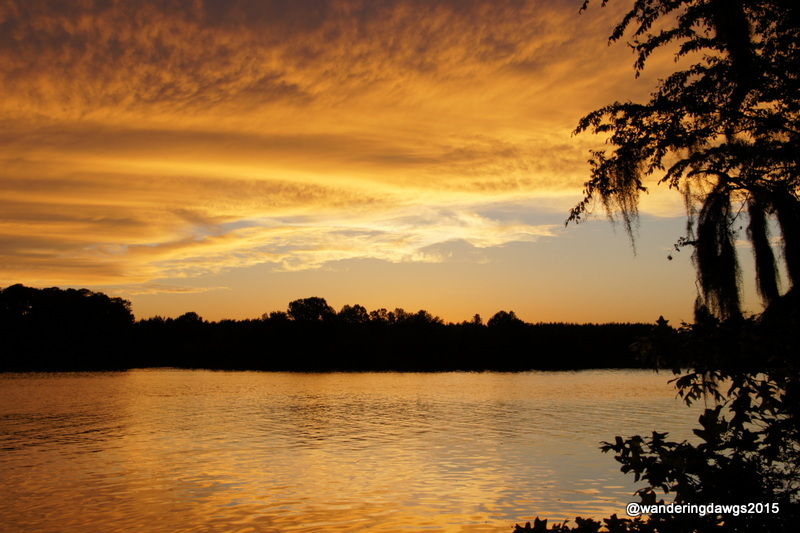 There are two fishing piers, a marina and boat launch, canoe and kayak rentals, playground, camp store, and several hiking trails. 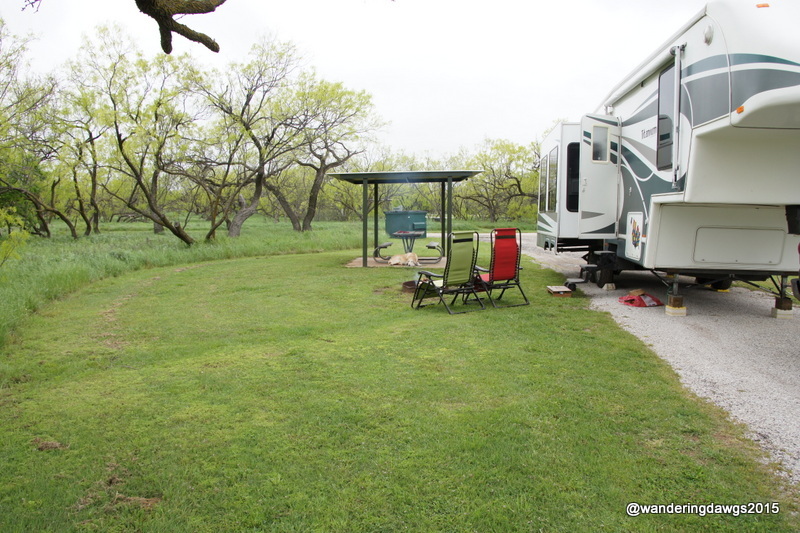 Click to read my campground review of Inks Lake State Park. There is so much to see and do in the Texas Hill Country we could have stayed a month and not seen in all. Unfortunately, we only had about two weeks to explore this beautiful area in the heart of Texas. The hill country includes San Antonio and Austin and extends west about 200 miles. Driving through the area on mostly twisting, two lane roads we saw canyons and creeks, dance halls and wineries, historic sites and ranches, quaint small towns and old homesteads, green grass and more wildflowers than I ever imagined. We dined on barbeque and schnitzel and I bought a cowboy hat! Our first home base in the hill country was Cranes Mill, a beautiful Corps of Engineers park on Canyon Lake near New Braunfels. We enjoyed driving on the country roads to explore the area. The bluebonnets were really starting to bloom and we saw more and more each day. 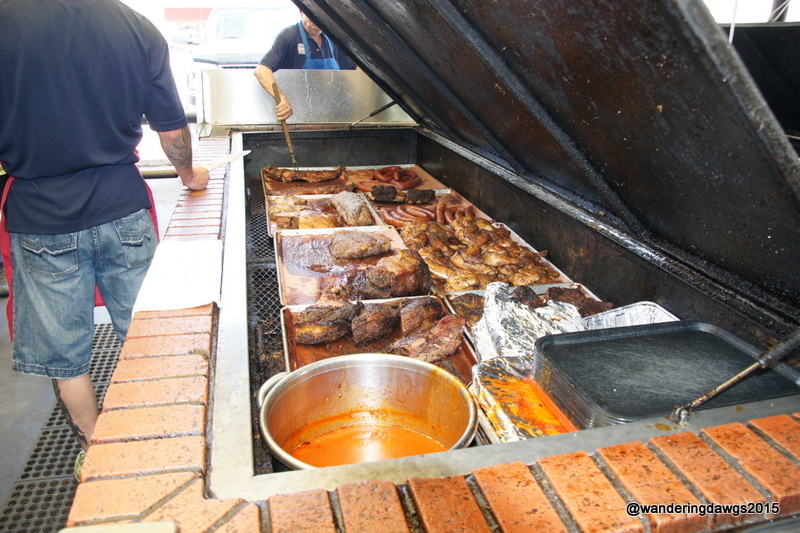 The first order of business was to eat some Texas Barbeque. One of my brothers lived in San Antonio for a few years and told us not to miss the Salt Lick in Driftwood, Texas. We started out our first full day in the hill country driving the back roads to have our first taste of brisket, ribs, sausage and turkey. After our delicious lunch we stopped to visit the Dr. Joseph Pound homestead. Dr. Pound and his family settled there in 1853 and raised 9 children. His descendants lived in the home continuously until 1983. On a beautiful sunny Friday we took a drive to Luckenbach and a winery near Fredericksburg. We enjoyed touring the LBJ State Park and Historic Site in Stonewall. Lyndon Johnson was our 36th president and spent much of his presidency at his ranch on the Perdanales River. Adjacent to the ranch is the Sauer-Beckmann Living History Farm, a working farm which recreates a Hill Country farm at the turn of the 20th century. The driving tour of his ranch goes around the air strip where he would land in a small plane he called Air Force One Half because Air Force One was too large to land on the landing strip. President Johnson left the ranch to be enjoyed by all the people so there is no charge to tour the park. We also enjoyed visiting some of the towns in the area. Many of the older buildings in the hill country are made of stone because of the lack of wood for building. On a sunny Palm Sunday we strolled through the town of Gruene where we enjoyed music at one of the oldest dance halls in Texas. Our Sunday drive continued to the artistic town of Wimberley and a walk along the banks of the Cypress Creek. While driving around we passed many interesting ranches and the Albert Dance Hall and Twin Sisters Dance Hall. Although we were still a little early to see the bluebonnets in all their glory we enjoyed seeing patches of them beside the roads. When we weren’t sightseeing we enjoyed our large lake front campsite at Crane’s Mill.